¶ 4 Leave a comment on paragraph 4 0 The USPOD had been involved in history work since the late nineteenth century with its commemorative program, but that work never included historians. NPS officials were much more systematic in their approach to selecting sites for federal protection and interpretation. They developed criteria based on persistent themes they devised for major time periods to construct a progressive narrative of the American past.4 In contrast, the UPSOD never turned to or employed historians for guidance in making their commemorative selections. Instead, the office of the Third Assistant Postmaster General in consultation with the Postmaster General—political appointees—balanced the requests, and pressure, from citizens and their Congressional representatives when selecting which episodes carried national significance. By the time the NPS sought suggestions for new historic parks, civic boosters and history enthusiasts already knew they could petition their government to ask that their favorite historic site, event anniversary, or hero represent the United States through publication on a postage stamp. NPS may have benefited from the USPOD’s established process. ¶ 5 Leave a comment on paragraph 5 0 Letter writing campaigns to the USPOD continued into the 1930s, as civic and political groups saw there was power in circulating messages on stamps. Beginning in 1933, we see that commemorative selections retreat from featuring regional and local anniversaries, and instead focus on celebrating state anniversaries, broad national themes, and supporting contemporary federal programs. We can attribute this shift directly to the election of Franklin Delano Roosevelt. He used the commemorative stamp program to build popular support for his federal initiatives. He understood that the visual language of stamps, printed by the USPOD, carried great power and could reach large numbers of Americans. Stamp collecting already appealed to many different people in first half of twentieth century and as a philatelist, FDR saw collecting grow as a hobby from the nineteenth into the twentieth century. During FDR’s first term, the USPOD printed more special commemoratives than in previous administrations.5 Individuals and political groups campaigned for stamps to represent African American achievements and women’s suffrage, which came in 1936 and 1940. During these public calls for commemoratives to more fully represent the American past, the USPOD continued its role as an arbiter of cultural symbols. 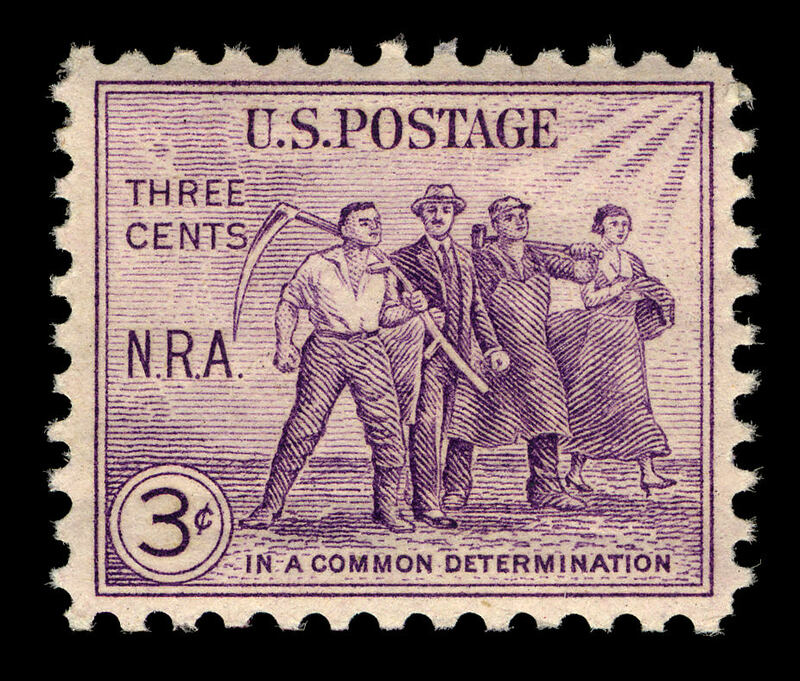 Stamp collecting surged in popularity during the Depression years, and more individuals saw, saved, and valued commemoratives as miniature memorials. When saved in an album, collectors reviewed and reflected on a stamp’s imagery and often researched the scenes and individuals represented. Subjects chosen to represent the US on a commemorative stamp lived on beyond the time period of their issue. For the first time, a president who was an avid collector, directly influenced stamp selection and production.